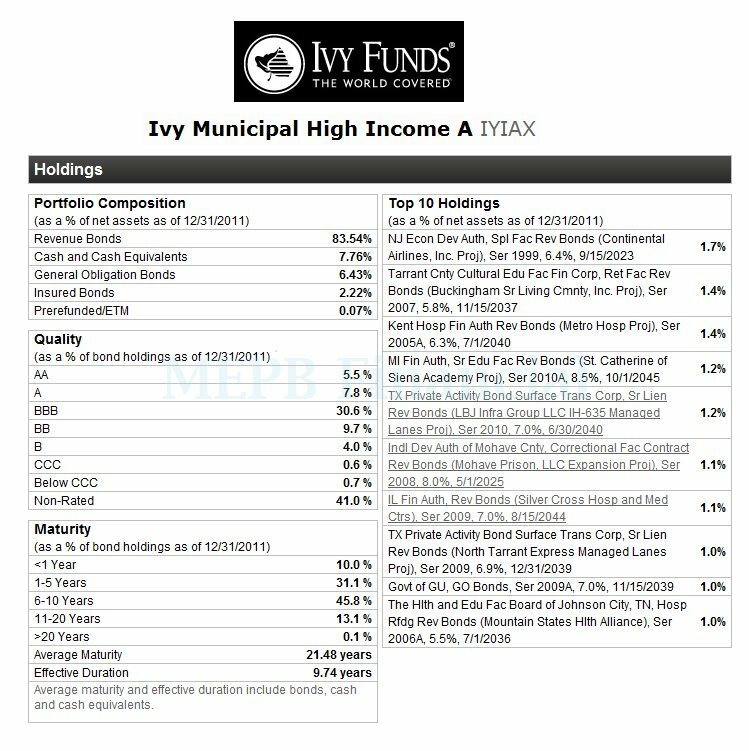 The best high yield muni bond funds of 2012 are: Ivy Municipal High Income A, Delaware National High-Yield Municipal Bond A, etc. These muni bond funds provide high tax free yield for investor. There are two types of national municipal bond mutual funds: investment grade muni bond mutual funds and high yield muni bond mutual funds. These high yield municipal bond funds are very similar to regular high yield bond mutual funds. The only difference is the yield from municipal bond funds are exempted from federal income tax. Typically high yield munis also has higher yield than investment grade munis. According to the Moody’s study, the high yield munis has lower default rate than regular high yield corporate. High yield munis have 4.3% default rates on an annual basis and high yield corporate bonds have 32.7% per year default rates. This study was done based on 1970-2005 data. These high yield municipal bond mutual funds are rated based on its performance for the past 5 years. 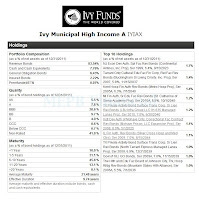 Most of these high yield municipal funds are also rated among the best in their class. Please check details about its expense ratio, sales load, initial investment requirement, performance, risk, top holdings, turnover rate, etc. The Ivy Municipal High Income fund objective is to provide a high level of current income that is exempted from federal income tax. This high-yield muni bond fund utilizes its asset to purchase a diversified portfolio of tax-exempt non-investment grade municipal bonds. The fund invests in municipal bonds with maturities of 10 to 30 years. It may invest in higher-quality municipal bonds. This high yield municipal bond mutual fund has 5-year annualized return of 5.66%. The fund manager of this IYIAX fund is Michael J. Walls. Morningstar gave this fund 5-year rating. The minimum initial investment to start investing in this IYIAX fund is $500 for brokerage account. No IRA account available. This fund has 0.95% annual expense ratio compared to the average in high yield muni category which is 1.02%. The Delaware National High-Yield Municipal Bond fund invests majority of its net assets (>80%) in lower-rated municipal securities. These junk rated municipal bonds provide higher income potential and involve greater risk than higher-quality securities It will invest its assets in securities with maturities of various lengths, depending on market conditions, but usually have a dollar-weighted average effective maturity between 5 and 30 years. The fund manager of this high yield muni bond fund since 2007 is Stephen J. Czepiel. The fund has 4.70% monthly dividend yield. The annual expense ratio is 0.85%. The top 10 holdings represent 16.19% of the total portfolio of 194 total holdings. The effective duration of this fund is 6.89 years. The 3-year annualized return of this fund is 14.56%. The Franklin High Yield Tax-Free Income mutual fund seeks to provide investors with a high current yield exempt from federal income taxes. It also tries to provide capital appreciation. This high yield muni mutual fund invests >80% of its net assets in securities whose interest is free from federal income taxes, including the federal alternative minimum tax. This FRHIX fund has total net assets of $7.97 billion. This fund has 4-stars rating from Morningstar and has Gold rating given by Morningstar analysts. The 10-year annualized return is 5.49%. This muni bond mutual fund can be purchased from 93 brokerages like Vanguard, JP Morgan, Merrill Lynch, Schwab Retail, Morgan Stanley Advisors, etc. Investor can start investing in the brokerage account with $1.000. The investment objective of this DWS Strategic High Yield Tax Free fund is to achieve a high level of income exempt from regular federal income tax. The fund uses its net assets to buy the municipalities securities across the U.S. whose income is free from regular federal income tax. The fund’s managers are Philip G. Condon, Rebecca L. Flinn and A. Gene Caponi. The fund has 4.84% dividend yield that is distributed on daily basis. The effective maturity of this NOTAX fund is 8.93 years and the effective duration is 6.64 years. Morningstar has rated this fund with 4-stars rating. The Waddell & Reed Municipal High-Income mutual fund objective is to provide a high level of income that is exempted from Federal income tax. Michael J. Walls is the lead fund’s manager of this fund since 2008. The 3-year annualized return is 13.06%. The fund has annual expense ratio of 0.89%. Investor can start investing in the brokerage account by buying this top municipal bond fund with as little as $500. The annual holdings turnover as of February 3, 2012 is 14.00%. The index benchmark is BarCap HY Muni TR USD. The Legg Mason Western Asset Municipal High Income fund invests majority of assets (>80%) in municipal securities. Based on the load adjusted return, this fund has returned 6.52% over the past 1-year, 12.34% over the past 3-year and 4.49% over the past 10-year. Morningstar has rated this fund with 4 star rating. The last dividend was distributed on January 31, 2012 ($0.06). This muni bond mutual fund is managed by Stephen A. Walsh. There are 76 brokerages which offer this fund for muni investors. The dividend yield is 4.92% for the past 12 months. This MFS Municipal High-Income fund has 4-stars rating from Morningstar. The annual expense ratio of this high-yield muni fund is 0.70%. This best high yield municipal bond fund has 23 years of positive return within its 27 years in the market. The YTD return is 3.69%. The average effective duration is 9.97 years and effective maturity is 20.73 years. 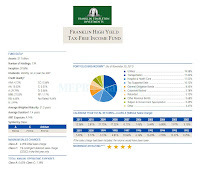 This Putnam Tax-Free High Yield fund is currently managed by Paul M. Dury, Susan A. McCormack and Thalia Meehan. The asset allocation of this best bond fund is 97.93% in bond and 2.07% in cash. This fund is on the 43% rank in High Yield Muni category. This minimum initial investment for either brokerage or IRA account is $500. The 12b1 fee is 0.23% and the front-end sales load fee is 4.00%. The 10-year annualized return is 4.86%. 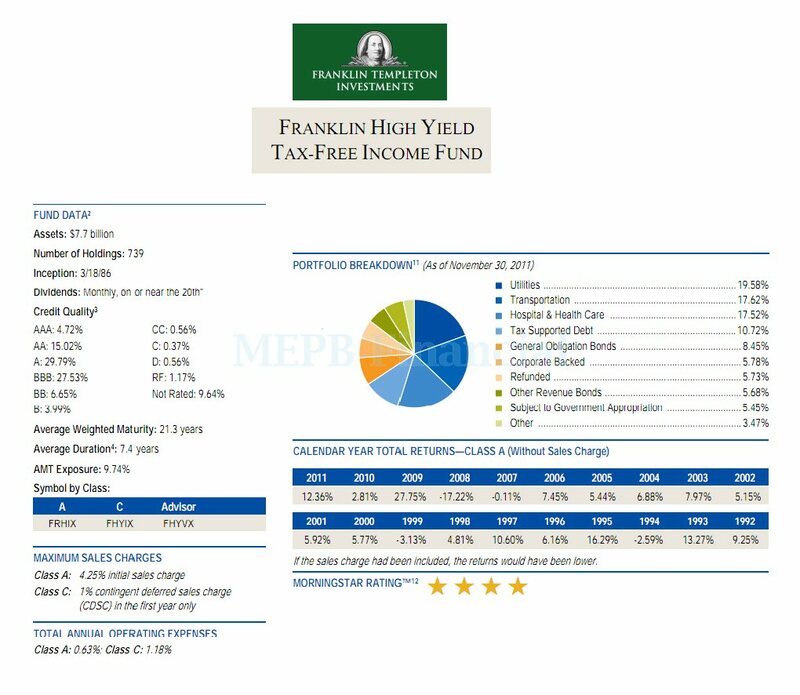 The JHancock High-Yield Muni Bond fund’s objective is to achieve high current income exempt from federal income taxes consistent with capital preservation. This best municipal bond mutual fund invests most of net assets (>80%) in municipal bonds of any maturity with credit ratings from A to BB. The annual expense ratio of this fund is 0.99%. The fund has 4.60% dividend yield. The fund has 159 total holdings. Frank Lucibella and Dianne Sales are the current fund manager. The top 3 largest industries are development (16.12%), Pollution (10.49%) and Transportation (10.18%). The 12-month dividend yield of this Prudential Municipal High-Income fund is 5.04%. The most recent distribution in January 2012 is $0.04. Morningstar has rated this high yield municipal bond fund with 3-stars. The 5-year annualized return of this fund is 4.13%. The 3-year beta is 1.23. This highest yielding municipal bond fund has 5-year average return of 4.13%. It has its best 1-year total return in 2009 with 23.04%. The investment aim of T. Rowe Price Tax-Free High-Yield fund is to provide a high level of current income exempt from federal income tax. This PRFHX fund has returned 16.36% over the past 1-year and 3.95% over the past 5-year. It has 4-stars rating from Morningstar. The Morningstar analysts have given the fund Gold rating. The total net assets of this high yield muni mutual fund are $1.38 billion. The minimum initial investment for brokerage account is $2.500 with $100 minimum subsequent investment. The annual expense ratio of this Oppenheimer Limited Term Municipal fund is 0.73%. The dividend yield is 4.85%. The current fund manager is Daniel G. Loughran. He is the Senior Vice President in Oppenheimer Fund since 2007. The top 3 holdings are NJ Tobacco Settlement Financing Corp (2.5%), LA Tobacco Settlement Financing Corp (1.8%) and TX Municipal Gas Acquisition & Supply Corp (1.7%).